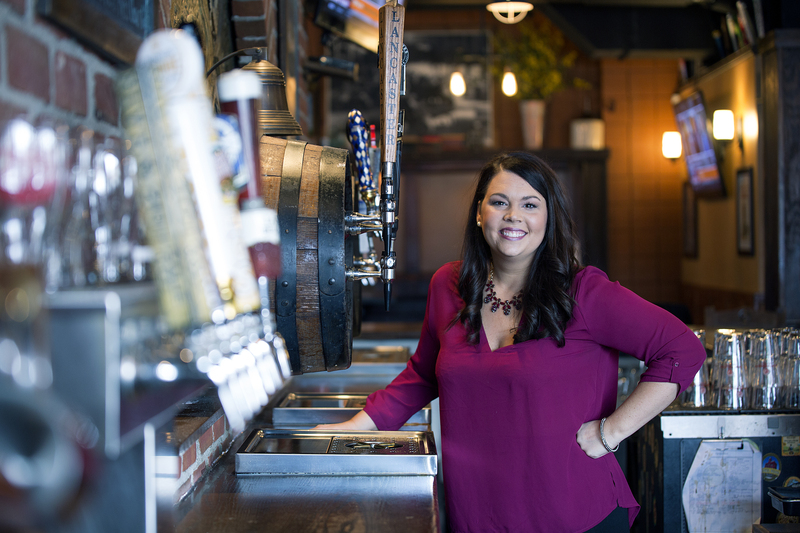 The Erie Reader wanted to catch up with a few past 40 Under 40 recipients, to talk progress, the evolution of their businesses, and the current state of small business here in Erie. We spoke to Aaron Lewis of Sphere Brakes, Kristi Bailey from the Erie Federal Credit Union and Katie Hanlin-Stachewicz of U Pick 6. 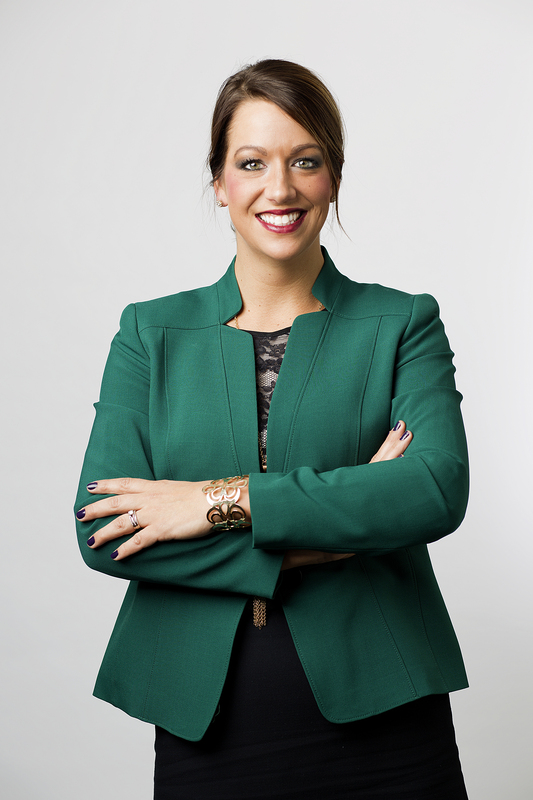 Cara Suppa: What's new with you and your business since you were featured in Erie Reader's 40 under 40? Aaron Lewis: A lot has happened since 40 under 40. Most notably we've secured a government contract to scale our technology [spherical brakes that apply braking force multi-directionally and within a smaller effective diameter] on similar tactical vehicles. That may precipitate additional contracts based on how we and the technology perform. In addition to that business development opportunity, we're strategically partnering with a fellow PA supplier in the racing industry. Over the past few months we've secured development and testing opportunities with several championship winning race teams in an international racing venue. 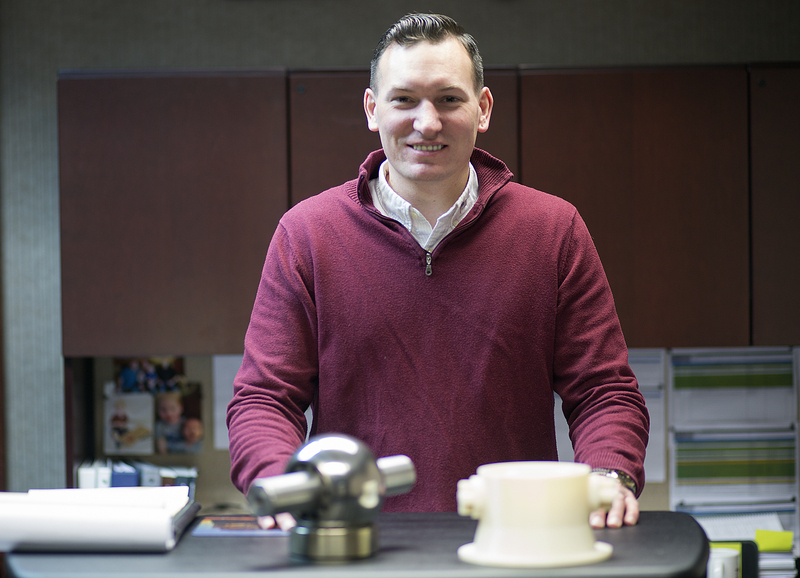 Aaron Lewis of Sphere Brakes has enjoyed an uptick in buyers of his patented braking technology, in both the military and racing industries. Kristi Bailey: I'm still employed at Erie Federal Credit as Director of Business Development and Services. Last summer we opened our new branch and corporate offices in the former Glenwood Elementary School. It's been awesome being centrally located and so visible to the community — our membership is growing. Late last summer, I also stepped up as the new President for Young Erie Professionals. I've been busy assisting with the transformation of the organization and am extremely impressed with the new leadership team and how much we have accomplished so far. Kristi Bailey, Director of Business and Development Services at Erie Federal Credit Union, is pleased with the increased visibility that's come with their new offices in the former Glenwood Elementary School. Katie Hanlin-Stachewicz: Quite a bit! In January of 2013 we opened U Pick 6 Public House on the west side of Erie, and an eastside location in October of 2015, the Harbor House on Buffalo Road, and with the growth of our pubs and restaurants, as well as the growth of our personal family, we decided to close my advertising business, Creative Affairs, so I could focus on marketing with U Pick 6 and raise our kids. We are currently working on two new concepts on the downtown bayfront — a new restaurant with an emphasis on fresh seafood, also featuring an oyster bar, as well as a rooftop bar overlooking the bay. Katie Hanlin-Stachewicz stands behind the bar at the U Pick 6 Tap House on lower State Street. The U Pick 6 family aims to expand in the near future, with plans for an oyster bar and rooftop bar near the bayfront. CS: Just the other night on the news they were talking about small businesses in Erie, and how there are more "deaths than births." But it looks like that tide could be changing, with more and more young entrepreneurs going for it in this city. What are your thoughts about the state of small businesses here in Erie? AL: If we look at statistics, then yes, there will always be more deaths than births when it comes to startups. That is normal and that will never change regionally, nationally, internationally. But I think everyone needs to be aware that there is a very distinct difference between startups and small businesses. That doesn't always come across as clear, and it really confuses the competitive and economic landscape of Erie. Based on my experiences, both small businesses and startups are thriving here in Erie. And I'm seeing a lot more involvement and collaboration with organizations who have been structured and funded to support that economic growth…I feel very confident in the direction Erie is moving. KB: Small business is booming in Erie — and I've seen the proof in the new small businesses who come in to open new business accounts at Erie FCU. The trend has also been that most of these new business owners are under the age of 40. I love the entrepreneurial mindset and am happy there are young people out there willing to take risks to follow their passion — especially when it's to better our community! KH: More "deaths than births" I think can be described with one word…revolution. Erie has several resources that promote and assist with small businesses. If you don't experience the growing pains, and learning from your mistakes, then how do you become successful or grow as a business and a person? Erie has passionate young entrepreneurs that continue to keep the business sector growing from the "deaths" to create more "births." If we keep the momentum moving, the revolution and growth of small business will continue. We are a good example of that! CS: What is the one crucial piece of advice you would give to someone interested in starting a small business here in Erie? AL: Start having conversations with the Ben Franklin Technology Partners, SCORE, the SBDC, the Innovation Collaborative, and Radius CoWork. Those are just a few of the many resources anyone can reach out to for free to get candid advice and feedback. And, oh, by the way, all have world-class professionals and mentors collectively making Erie better and more competitive. Here's another golden nugget: Don't forget that there is a movement taking place throughout Erie called the Silver Tsunami [i.e., an aging workforce]. There are several hundred well-established small businesses in need of young entrepreneurs to take over the helm. KB: Get connected and stay connected. This community is extremely passionate about supporting small business and shopping local whenever possible. The more people who know you and your business, the more they will want to support you and the success of your business! KH: Never lose your passion. As hard as things may get or seem, always remember why you went into business. Without that, you can lose sight of your brand, company growth, and momentum. Once you create a culture within your business, always keep that in sight! CS: Were there any opportunities, resources or advantages here in Erie that you made use of (or continue to use) to start your business/help it grow and thrive? AL: Sure, look at my answer to question three. I've worked with and continue to work with all of them. In addition to those companies, my affiliates have stepped up in so many ways to hedge the burden of start up costs while significantly reducing risk. I'm very grateful for their continued support. KB: I love Radius CoWork in the Renaissance Center and the people who are involved there. Each time I visit, I leave feeling really energized about our city's future. There are a lot of great people doing amazing things there. KH: We feel that we need to support local business in hopes of creating that culture of supporting each other and the local Erie economy. Just to name a few [resources]: business banking with Northwest Savings Bank, who took a chance on us and our vision; C.A. Curtze & Sons, who have helped us with products; Schaffner, Knight, Minnaugh & Co., who gave us great tax and business advice; Jason Elwell Construction for our construction and maintenance needs; and Copyright Printing, who helps us with our printing needs, and many more. CS: What do you think are some of the greatest challenges for starting a small business in Erie? AL: My greatest challenges have come with the plethora of requirements and regulations around government contracting. Despite having a strong regional procurement technical assistance center representing NWPA, there is a serious knowledge gap in what it takes to conform and execute government contracts efficiently. KB: People starting a small business in Erie have a difficult time figuring out where to start! There are so many organizations willing to help and who have the resources, it's just tough knowing who does what in the beginning. It'd be great to have some sort of road map for starting a small business in Erie and list all the resources available to them. KH: I think some of the greatest challenges come with start-up for any business. It's establishing business relationships with the right people, finding dedicated employees, and creating that culture of doing "good business." CS: Other than your own, what is your favorite small business in Erie and why? AL: That's a tough question because the list is so diverse. My favorite "startup" that I've been watching for quite some time is RendrFX. They have a very tangible product which is easy for me to understand and provides opportunities for rapid growth. KB: I'm a bit partial to Ember + Forge. My friend, Hannah Kirby, followed her passion and took a risk to open a very cool "local" coffee shop downtown. Her business is doing great and watching her succeed has been a pleasure. KH: As a mother, a few of my favorite businesses in Erie are where I create memories with my family: Sunday breakfast at Avantis, visits to the Experience Children's Museum or the Erie Zoo, a trip to Waldameer Park, painting at Claytopia…just to name a few! I am sure there will be plenty more as we continue to raise our family here in Erie. Erie's 2017 "40 Under 40"